Well, I would always recommend taking anything Reid Scott says with several large grains of salt, though he doesn’t appear to be in his most “why don’t I torture the audience” mood, for which we can only be grateful. 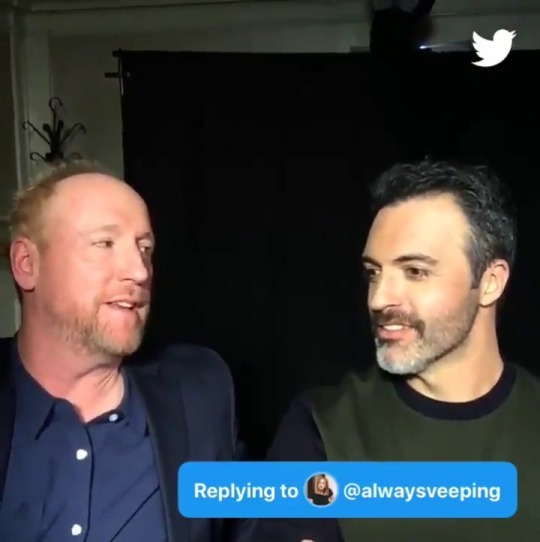 Like a lot of actors, Reid Scott tends to kind of answer questions from the perspective of the character at the time he’s asked the question. So I actually find it pretty significant that he’s apparently moved from his usual comment – that Dan is barely capable of human emotion – to saying openly that he loves Amy. That is a big shift in his perception of Dan and his limited inner landscape, that’s for sure. Hence, I think, the description of Amy as “sweet” which is hilarious to me on so many levels – Dan Egan is almost certainly the only person in the world who would think of her that way. (And it does make a kind of sense from his perspective – compared to Dan, she is). And a lot of this comes down to a philosophical question about what love is. I mean, I don’t understand how Dan’s feelings about Amy can be described as “not romantic” because it seems to me all the necessary components are there – the physical attraction, the affection, the intimacy, the desire for her exclusive attention – it’s just that Dan is a terrible, terrible person. And one of the ways that he’s terrible is that he tends to take advantage of situations where he thinks Amy is stuck with him – if he thinks there’s no realistic possibility of her leaving, he gives free rein to his assholishness. (This is one of the qualities that has the potential to seem close to abusive if the writers don’t handle it carefully). Also, Matt Walsh’s face is hilarious all the way through this. @thebookofmaev Amy in a bright and vibrant red dress. What are your thoughts on Amy’s dress here, especially since red is usually Selina’s signature color? Not sure if Reid is dressed as Dan here or not, since Tony was out of costume in the video. Is that red or orange, I can’t tell from the lighting? I ask because the set behind her could easily be Jonah’s mother’s house, and we saw a similar style dress there. They seem to be in that set a lot in the sixth episode – I wonder if someone is pleading with Jonah to join their ticket as VP. I mention this because Amy copying Selina’s Power colour would make an awful lot of sense for a scene where she’s trying to use her leverage to the utmost. If Amy’s his campaign manager, she may actually be the person everyone has to convince. Amy stealing Selina’s style so blatantly is very All About Eve – I hope they get the tone right, and don’t turn it into some Game of Thrones “younger and more beautiful” nonsense. I’m holding out hope for a moment between them that is at least pleasant – Selina’s constant vitriol towards Amy has become very wearing over the last two years, especially with how gendered it’s been. Any repeat of that Leon West nonsense, and I will swear loudly and at length. As for Dan – I would assume he’s in costume if only because of the distinct lack of facial hair. I don’t think I’ve ever seen a real life pic of Reid Scott where he’s that clean-shaven. (Which I assume is a comfort thing? As hirsute as he appears to be, he must have to shave twice a day at least when playing Dan, which seems like it would be rough on the skin).